In a med. saucepan, combine water, sugar, lemon juice and rind, and spices. Bring to boil, then lower heat and simmer covered for 15 min. Add red wine to mixture. Cover and heat well, but do not boil. Keep very hot to serve. Serve in a clear punch glass with a fresh stick of cinnamon. Hot spiced wine or cider will make your house smell like the holidays. Serve it in clear class cups to reveal its beautiful color. Use a good red table wine., but you don't need the most expensive red wine since you are adding spices and flavors to it. Boil the spice mixture but don't boil it once you add the wine or the wine will become bitter. You can add another cup of water or apple ciderto the wine mixture to smooth it out without worrying that you will dilute it too much. 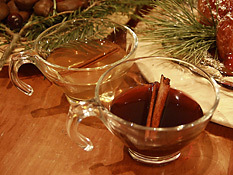 Follow the same recipe for Hot-Spiced Cider using apple juice or apple cider instead of wine.